If you’re an author in Canada looking to partner with someone who can offer advice on publicizing your novel, or nonfiction book, devise a strategy for book publicity and perhaps even marketing, and then help you to implement a plan of action, you’ll most likely need a book publicist. This could be either through working with a freelance publicist, of through an agency specializing in the publicizing of books. If you’re searching for a publicity expert, then we’ve compiled the following list of 5 top book publicists in Canada for you to take a look at. Rachel Sentes is a book publicist and CEO of gal-friday publicity. Rachel and her organization has helped clients get featured on numerous renowned television broadcasters such as CBC, CNN, News1130, among others, along with well-known newspapers and digital publications such as USA Today, The Globe and Mail, Huffington Post, Vancouver Sun and San Francisco Chronicle. When it comes to publicity, gal-friday publicity specializes in promoting books and has various book packages that are designed to enhance your visibility, to create a book publicity plan, to help develop a fan base, put together effective pitches to approach media contacts, create an eye catching author website, offer advice on publishing options (both traditional and self-publishing) and on distributing your book, making it available as an ebook and for sale through retailers. Take a look at this page to find out about the packages on offer and the services they include. With regards to fees, gal-friday publicity works either on a project basis, which come with flat rates, or through monthly retainer rates for publicity over an extended period of time. Founder and President of Graf-Martin Communications Inc, Ellen Graf-Martin is a highly experienced individual in publicity, marketing and creating new business, with particular emphasis in ministry and the non-for-profit sector. Her background includes managing publicity campaigns for many bestselling authors and acting as a consultant for organizations such as World Vision Canada and Power to Change, among others. If you’re an author of a Christian book, it is worth considering Graf-Martin Communications Inc, which is based in Elmira, Ontario. Ellen is supported by Danny Graf-Martin who is a co-founder and a team of staff who together make an experienced provider of integrated marketing, branding and publicity campaigns, especially of Christian books across Canada. You can choose from three book launch packages, which are entitled Ready to Grow, a basic package, an Accelerated Growth Package, which contains everything in Ready to Grow and more, and a VIP Custom Package, which contains an even larger list of publicity and marketing elements. Take a look at this page to find out about what specifically is included in these three packages, and to make contact with Graf-Martin Communications Inc, if you’re interested in any of the options available. Debby de Groot runs MDG and Associates and has been doing so for more than 26 years, offering publicity and marketing services to literary, cultural and food sectors. Her experience in the publishing industry began in 1982 and previous organisations she has worked for include HarperCollins, Southern Book Publishers, Key Porter Books and Penguin Group (Canada). MDG and Associates has worked with some high profile clients such as Reader’s Digest, the Guinness Book of Records, Random House, the Hockey Concussion Education Project, the Munk Debates, Wiley Canada, and the Penguin Group, among others. If you would like to enquire about how Debby might be able to help you with your book publicity needs, you can email debby@mdgassociates.com or ring (647) 295-2970. Zoe Grams who has an MA in Philosophy is founder of ZG Communications and previous to starting this organization, in London and Vancouver, she ran marketing campaigns for clients across Canada and the rest of the world. Her experience also includes publicising books by authors at D&M Publishers and she has secured media appearances for clients that run into the hundreds. At ZG Communications, which specializes in book launches, along with strategy creation and campaigns that raise social awareness, Zoe manages publicity and promotion for Vancouver Writing Fest. If you’re interested in finding out about how one of Canada’s major publicity organizations can help you with publicising and promoting your book, you can find contact details at this page. DigiWriting is a specialist provider of book marketing and publicity services to authors and small publishers. Based in downtown Toronto, the organization has various book marketing and publicity packages such as its Book Launch Service, which contains elements such as a book review listing, a professional press release, a media kit, social media marketing support, among other things. Another example of a package is its Publisher Marketing and Publicity option for independent publishers who want to outsource book publicity. The organization also has various custom book publicity services on offer. Do take a good at DigiWriting’s website to get a better idea of its services. Contact DigiWriting to provide further information about your book publicity project, your budget and a consultant from the organization will get back to you. Are you a book publicist in Toronto, Ottawa, Montreal, Vancouver, Calgary, or in another part of Canada? Please introduce yourself in the comments box and leave a link to your website! 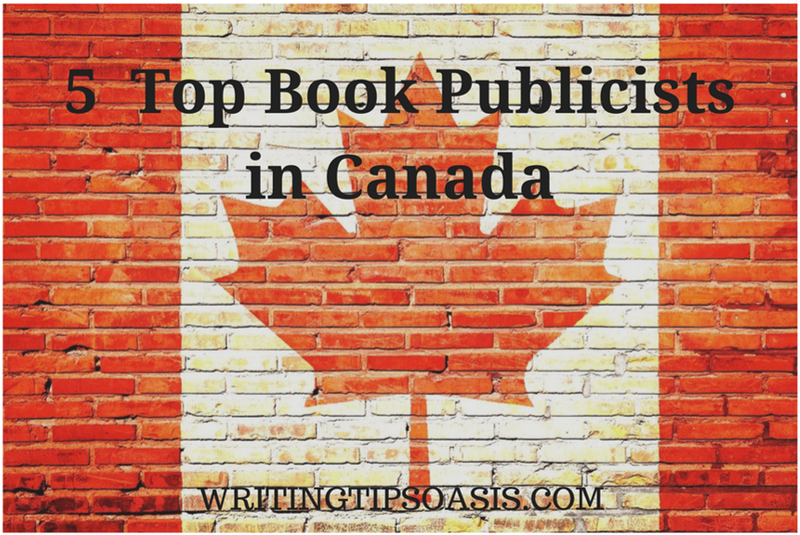 5 Top Book Publicists in Canada is an article from Writing Tips Oasis. I’ve been involved in writing two books for 5 years both of which are now published. Freedom Justice Change Challenge & Peace and Education for Better Life are the titles of the two books. I have tried marketing through amazon, facebook pages, and several professional promotional book services, but I would like some further advice on how best to effectively promote my books. I have not received any cheques from the professional promoters yet despite spending a lot of money on their services. The inspirations I had for this book are Martin Luther King, Nelson Mandela, Tom Douglas and Bob Marley who were also fighting for people’s rights. Freedom Justice Change Challenge & Peace is a book that talks about more about freedom and Justice, what can help people, and changing people’s life. But not only that about that, we also want change in the world and also with the Gospel too. Especially there is also an important message for Congolese people, all Africans and other all nations such as Caribbean, Asians, Arabs, Latinos, brown people and Caucasians. This is for everybody and all ages. This book Education For Better Life is about to educate people to change their lives to go back to school for having diplomas, better jobs/ have your own business and have better lives. It will also help people have struggle/ disability lives. Above all I would like people to read my books and make some sales. I’m looking for someone can helping me for promoting, advertising, and market my books. For example it can go on Facebook, Twitter, E book, Email marketing, newspapers, and it can also go on chapters, bookstores, online stores and international or anything it doesn’t matter . If I need help for free or how much money its going to cost so I can spent money for marketing project? I build already my an audience Instagram, Twiter, Linkiendin, Facebook page and website. (they are all together in my one website, first off all go to Jako Depo – home l facebook (page), when you to my facebook page and you will find the website jakodepo10.wixsite.com click and it will let you in and will see everything in that website. Both of my books can also be advertising in these social medias. I need help and advice and how much money is going to cost me and looking for cheap promoter and market or it doesn’t matter to me. I need help as possible and how much is the percentage.